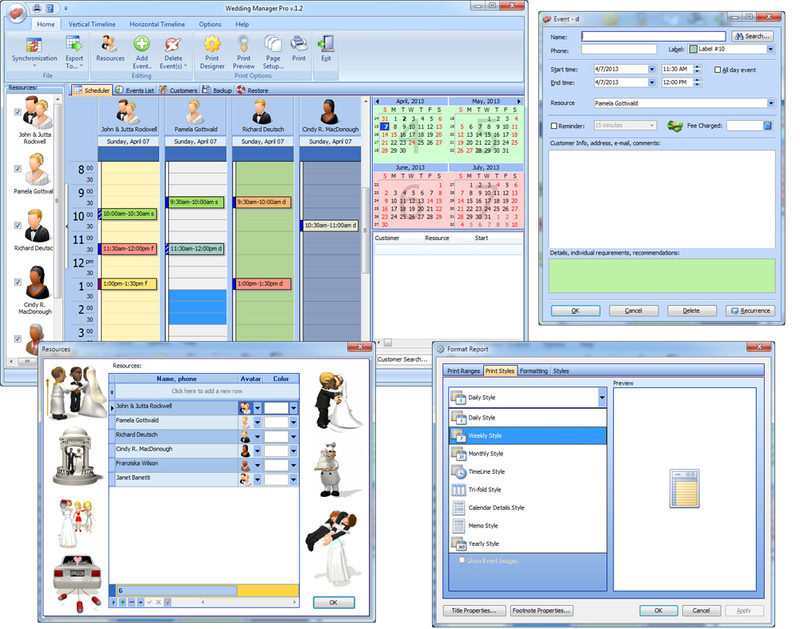 Wedding manager Pro as the name suggests is software which has been designed to serve event managers and wedding planners. The software is unique and is not something which you can find with many software development concerns. Now coming towards the navigation features of this software, it features a data navigator which allows user to access their data easily no matter how large your data base is. Data can be searched with reference to the clients name or even a date on which it was entered. Once you have got your desired data, you can easily edit or update it to your liking. The program also provides the feature of setting up numerous distinct work ranges which improves the efficiency of management of its user. A print designer has also been incorporated into the program which provides a large variety of unique templates for easy use. The print designer contains numerous easy to understand and use option through which you can get a clear and fine printout of any of the data or schedules that you want. Moving on, the program has an inbuilt handy interface which allows easy calculations and shows the fee charged. This feature enables event and wedding planners to make effective and quick decisions with clarity. A feature of reminders has also been provided which allows the planner to set different reminders of tasks to be performed. Automated search options and auto filling of fields for customers that are already present on the database is another trait that has been incorporated. One can easily track the past data of income with respect to dates and months and this allows you to graph your performance with respect to income. People using Microsoft outlook can easily export their desired data for formats such as XLS, iCal, TXT, PDF, ML, HTML so that such data can be utilized for other programs. So overall it's an effective tool which facilitates easy, reliable and effective management of both simple events and events that involve various complexities. Top 4 Download periodically updates software information of Wedding Manager Pro 1.8 full version from the publisher, but some information may be slightly out-of-date. Using warez version, crack, warez passwords, patches, serial numbers, registration codes, key generator, pirate key, keymaker or keygen for Wedding Manager Pro 1.8 license key is illegal and prevent future development of Wedding Manager Pro 1.8. Download links are directly from our mirrors or publisher's website, Wedding Manager Pro 1.8 torrent files or shared files from free file sharing and free upload services, including Rapidshare, HellShare, HotFile, FileServe, MegaUpload, YouSendIt, SendSpace, DepositFiles, Letitbit, MailBigFile, DropSend, MediaMax, LeapFile, zUpload, MyOtherDrive, DivShare or MediaFire, are not allowed! Your computer will be at risk getting infected with spyware, adware, viruses, worms, trojan horses, dialers, etc while you are searching and browsing these illegal sites which distribute a so called keygen, key generator, pirate key, serial number, warez full version or crack for Wedding Manager Pro 1.8 download. These infections might corrupt your computer installation or breach your privacy. A keygen or key generator might contain a trojan horse opening a backdoor on your computer. Hackers can use this backdoor to take control of your computer, copy data from your computer or to use your computer to distribute viruses and spam to other people.